They say history is made everyday, and even by those lax standards of historical significance, the FBI Academy of Quantico is on a real tear where breaking precedent is concerned. Miranda is the highest ranking female at the agency, and she’s in uncharted territory with Nimah and Raina, who are part of a new experiment to find out if you could, in fact, lose your mind when federal agents are two of a kind. Meanwhile, Simon is the first openly gay FBI recruit, a feat that will seem all the more impressive once everyone figures out that he’s not gay after all. And in all the years Miranda and Liam have been running their investigation drill, which is presumably inspired by The Usual Suspects, Alex is the first trainee ever to figure out none of the three crime scenes is real. It is truly a time of unprecedented change at Quantico. Sarcasm momentarily aside, man alive, there is a hell of a lot of crazy crap going on at the FBI Academy. Rather than pare down the story from the chaotic pilot, “America” actually piles more stuff on top of it. More characters are introduced, or in the case of the sort-of reinstated Caleb, reintroduced, and a ton of details are revealed about what happened in the gap between Alex arriving at Quantico and being named the primary suspect in a massive terrorist attack. That’s the fun part of a television show with this kind of flashback-flash forward structure. The writers get to drop bombshells early in the story, and when they do so correctly, those reveals get the audience invested in seeing what happened between points A and B. In a show like Damages or in the adventures of the Oceanic Six in Lost’s fifth season, the reveals are usually rooted in action rather than personal affairs, but Quantico has made clear its intentions to focus on the romantic lives of its characters. The two biggest reveals of the episode are about Alex’s love life, which predictably involves a love triangle with Ryan, and less predictably, unrequited advances from Liam. 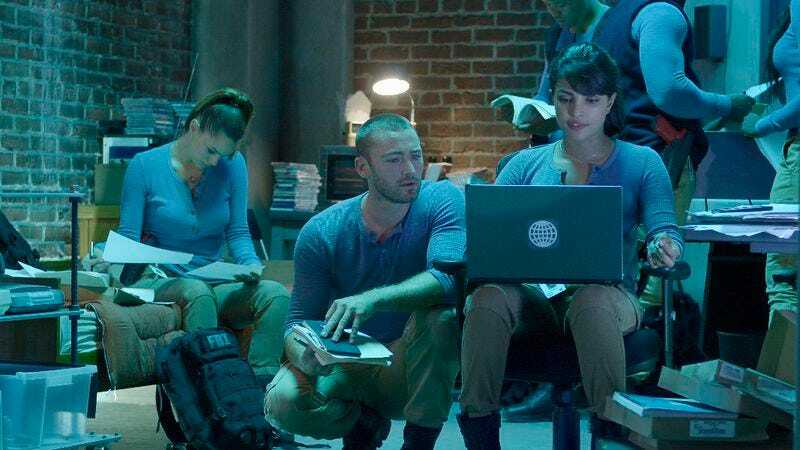 Quantico is in a somewhat awkward position with its elaborate plotting because most of Alex’s colleagues are as yet unaccounted for. Obviously Alex isn’t responsible for the terrorist attack, but someone in her cohort is, so the writers have to be very deliberate about which characters they bring into the present-day story lest they give too much away about who’s involved in the attack and who isn’t. The problem is that, unlike in Alex’s case, we only get to see the first half of the story without seeing the second half. Alex’s prickly relationships with Ryan and Nathalie, her newly introduced rival, are easy to invest in because now we know they’re going someplace interesting. Even for those who don’t find Alex’s romantic entanglements interesting, there’s evidence that it all adds up to reasonable, sound storytelling. But Alex’s story isn’t the one the audience needs reassurance on. It’s the other characters who are in desperate need of a flashforward drop-in, if only to ensure that their stories are not going in as maddening a direction as they appear to be. The story of Nimah and Raina should be intriguing, but it’s the plotline that most makes me feel like I’m being led down an unsatisfying path. When I think of twins pretending to be one person while training at the FBI Academy and maintaining a love-hate relationship with their faux-gay classmate, I think of a farcical comedy from the late ‘80s that would be advertised using the phrase “From the producers of Weekend At Bernie’s.” Quantico clearly isn’t meant to be a high-minded rumination on terrorism and the plight of intelligence officers, but the Nimah and Raina plot needs to be grounded in something real and consequential really soon, it’s going to float away. That’s too bad because as silly as it is, it could grow into something that’s cool and very appropriate for a show like this one, but at this point, the writers are overplaying their hand a bit. I’m more intrigued by the story of Simon, the probably not gay guy who did or didn’t go to Gaza under mysterious circumstances, but there are limitations there too because Quantico is seriously overtaxing my intrigue reserves. Every single plot is in the foreground, and every one of them involves some kind of secret that probably should have prevented them from enrolling at Quantico to begin with. Shelby is placing secret phone calls and speaking in what is presumably Arabic while Nathalie is applying a fake scar behind her ear. Miranda is still grappling with the emotional aftermath of a terrorist attack apparently mounted by her son, one she personally thwarted. Not even 15 minutes pass before Caleb is brought back into the fold as an analyst after a family member called in a favor to get him reinstated. It’s no wonder the assignment of the week, which involves following the clues in three crime scene recreations, feels so simplistic and slapdash. There simply isn’t enough time for much more with so many secrets to attend to. At the end of the season, it might look incredibly shrewd, in hindsight, to cram the show with this much story. After all, shows that follow this kind of structure typically do so within the confines of a 10 to 15-episode season, including ABC’s How To Get Away With Murder, which is kept on the short side so Viola Davis can work on other projects. If Quantico is supposed to go to a full 20 to 22-episode network season, it’ll need a lot of material to fill up all that time and leave enough dangling threads to fuel more of them. But right now, the show is like a massive buffet with only saucers available to eat off of. Alex has a Jason Bourne thing happening, by which I mean she’s on the run for a crime she obviously didn’t commit and has to convince people who are too dumb to put that together or have their own ulterior motives for reaching their conclusion. She tries explaining to Nathalie that she obviously wouldn’t do this in such a sloppy, obvious way, and it’s a pretty compelling case. Speaking of Nathalie, I was waiting to see a fight sequence with Chopra, but that isn’t the one I wanted to see. It’s pretty murky visually. Miranda: “You’ll never catch her. She’s too good. We trained her too well.” I’m surprised it took that long for that line to make it into the show, but I’m so glad it did. Turns out Alex’s father was a FBI agent, so that pot is still simmering somewhere on the world’s largest stove. Caleb’s name apparently isn’t Caleb? Which…yikes, this show is really piling on the frosting.